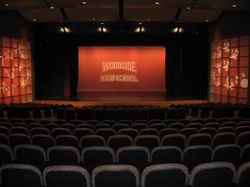 The Woodside High School Performing Arts Theatre has 478 plush seats. It has handicapped access and there is special seating for the disabled. Please let us know if you have any special seating needs. Seating is not assigned with numbers, it is on a first come, first served basis. So, please give yourselves plenty of time to get to the theater. Sanhiti shows are known to start on time, it is recommended to arrive 20 minutes early to get good seats. As with all auditoriums, no food or drink (including water) is allowed inside the auditorium. Parking is free and is right across the theater. We look forward to seeing you there!